Where can I get an Afghan Hound? Contact a local Afghan Hound club (eg. Nutmeg Afghan Hound Club), for assistance. 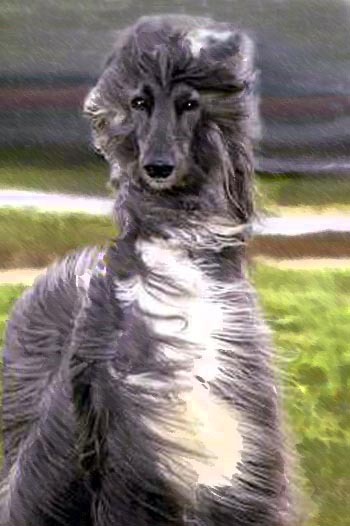 It may be helpful to visit an all breed dog show & talk to the Afghan Hound exhibitors who are entered. Please be aware that exhibitors are more receptive to your approach after they are finished showing. Lastly, don't forget about Rescue, which occasionally has fine purebred animals looking for homes. How do you care for the coat? Weekly and/or daily brushings are necessary in order to prevent the coat from matting. This breed has 'hair' rather than 'fur', so instead of shedding, the coat will mat. Mats left in for an extended period of time can hurt the dog as the mats can pull tight against the skin. If they get too bad or too large, they will need to be clipped or cut out. Weekly baths are a must if you are showing your dog. Visit the Afghan Hound Club of America's website for more information on Coat Care. Can I just shave it off? Afghan Hounds can be clipped into a 'puppy cut' style in which the coat trimmed to 1-2 inches in length. Some people will clip the body coat short but leave the top knot & the feet long. There is nothing wrong with keeping your afghan in this type of coat. It can be much easier on both the dog and the owner. I've heard this breed is really dumb. Is that true? Afghan Hounds are NOT dumb, by any means. They were bred to hunt in packs independent of their owners. This breed trait is still true today. They will do what they want when it suits them. And owners who understand this trait can compete very successfully in Obedience and related sports. How hard are these dogs to train? If you compare the training of an Afghan Hound to the training of a Golden Retriever, for example, you will find that you need to work harder to understand your dog than the owner of the Golden Retriever might have to work. Reward-based training works best with this breed. Afghan Hounds may shut down if they feel that they aren't getting anything out of it. It takes a lot of patience & lots of short training sessions, but putting an Agility, Obedience, or Rally title on an Afghan Hound can be done!! Afghans are hunters by nature, so yes they can be out 'hunting' in your yard. They like long walks and do well in classes that constantly make them think, like Agility and Rally. Yes, but as with all dogs, small children should be supervised when interacting with the dog(s). How much yard room do I need for an Afghan Hound? There is no set acreage requirement but the more that is available, the better. You can have an afghan in an apartment or condo as long as the dog gets enough exercise from walking. No, but most responsible breeders will require a fenced yard or the promise of putting one in. Each breeder is different and this is why you need to find a breeder who is a good fit to work with you when getting your first Afghan Hound. Afghan Hounds are hunters and their distance vision is superb. They can (and will) run right through the invisible fencing in pursuit of prey! And once outside the fence, the dog may not be willing to cross the fenceline to get back in. It is important to remember that this type of fencing does NOT keep stray dogs out of your yard. Afghan Hounds are generally a very healthy breed, but some have been known to have thyroid issues or hip dysplasia. It's best to discuss what whether the parents of a litter have had health testing before you consider purchasing a puppy.